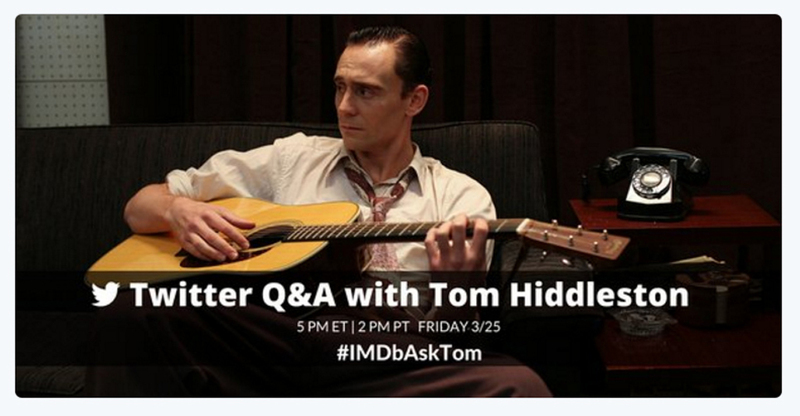 Actor Tom Hiddleston will take questions about his latest film, the Hank Williams bio pic I Saw the Light, via Twitter on Friday, March 25, 2016, at 5 p.m.
Got questions for Tom Hiddleston? Send them to #IMDbAskTom via Twitter. The popular British actor will respond to fans at 5 p.m. (Eastern Time) Friday, March 25, 2016. Hiddleston is on what must be an exhausting tour, promoting his latest film, I Saw the Light, in which he plays influential U.S. country music singer Hank Williams (1923-1953). The film opens in New York, Los Angeles, and Nashville today, March 25, and expands to more cities in the U.S. and Canada on April 1. Hiddleston has given print interviews and appeared on early-morning and late-night TV. 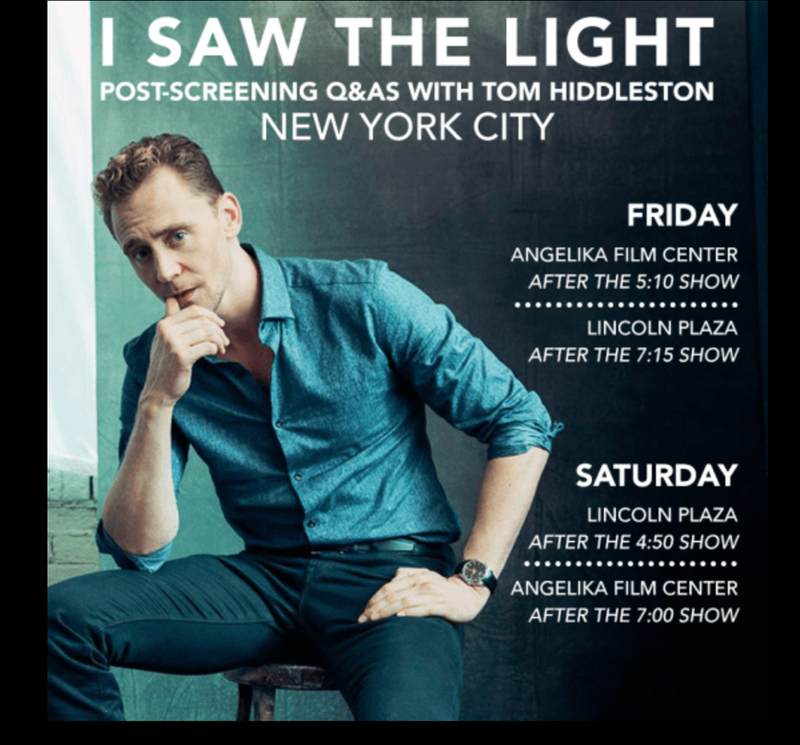 Tonight, after his Twitter talk, he will answer questions at two New York screenings of I Saw The Light, then he’ll particpate in two more New York Q&A sessions on Saturday. I bet those screenings have been sold out for a long time! British actor Tom Hiddleston will meet with his fans on Friday and Saturday, March 25 and 26, after New York screenings of his new film I Saw the Light. For those who aren’t already fans: Hiddleston’s international fan base gets bigger every day. They follow his every move on the Internet, and many have travelled hundreds, even thousands, of miles in hopes of seeing him on the set or at premieres. In the last few weeks he’s been burning up the air waves as a spy, trying to bring down an evil arms dealer played by Hugh Laurie, on the BBC TV series The Night Manager, which is based on a book by John Le Carré. The show will come to the U.S. in April. Of course, some fans have been smitten since 2008 when Hiddleston played curly-haired policeman Magnus Martinsson in the British TV series Wallander. Hiddleston went on to roles in Thor, Midnight in Paris, War Horse, The Deep Blue Sea, The Avengers, Only Lovers Left Alive, Thor: The Dark World, Crimson Peak, High Rise and I Saw The Light. Next Post See two classic Hong Kong gangster films Saturday night!